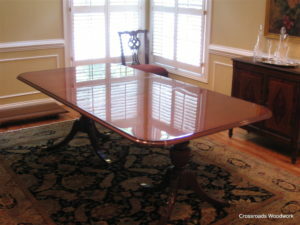 Custom Finishing: Most finishing is done with lacquer. However, some projects require a different approach. A primitive piece might need rubbed oil or shellac and wax. Or, oil paint for an old wicker rocker. Only professional grade finishes and colorants are used. See also Finish Matching. 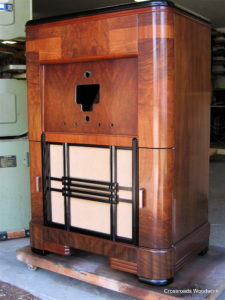 Example: A 19th century slant front desk finished in lacquer needed something more. Steel wool and wax increased it’s depth and gave a wonderful antique sheen. Custom Stripping: For twenty years I have used a professional flow over, water wash system. This system gets wood very clean and is not harsh on the wood or glue joints like older stripping methods. Finish Matching: A customer might find a chair that matches the design of their own set but not the color tone; an unfinished desk in a light wood needs to be matched to dark mahogany; matching replicated parts to the furniture on which they are used. It can be very challenging work but with patience and experience, excellent results are possible. 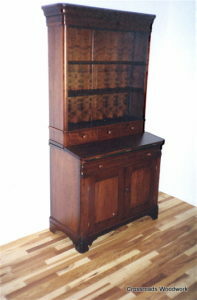 Example: A customer had been searching for a tall display cabinet and finally found one. It did not match the wood tone of her furnishings. The retailer delivered the new piece to me and it was refinished to match a drawer which the customer provided as a sample. Finishing For Woodworkers: Finishing services for professional cabinet and furniture makers. Straight ahead finishing or matching the finish on new work to provided samples. Example: Taking twenty new cabinet doors and drawer fronts for a kitchen refacing job and matching them to existing cabinets. Repairs – Restorations: A restoration takes place when a piece is damaged or dysfunctional and requires repairs, reproduction of parts, refinishing, etc. This requires knowledge and skill at woodworking in addition to finishing abilities. Example: A customer brought a cherry Empire secretary to me. It had been in an unoccupied house for over a year that became infested with termites. The harder cherry wood was tunneled through only to reach the softer pine in the shelves, base, drawers and back . The old piece was totally disassembled, all damaged wood replaced, and then old and new woods brought together in the finishing process. Repairs – Replications: Sometimes elements of furniture get broken, burned, chewed, or lost. With skill and care these missing parts can usually be remade and replaced. Example: A customer’s mahogany chest of drawers was being propped up by a wood block because the short turned leg ( see repairs – turning ) in front had snapped off and was lost. A new leg was turned in mahogany, affixed back to the chest, and then finish matched to the existing finish. The replacement looked original to the piece. Repairs – Turning: A “Lathe” is the machine used to turn wood. Turning is the technique of mounting a piece of wood between two spindles and spinning ( turning ) it while cutting designs/shapes into the wood. Many chair parts and table legs are turned for example. These can be carefully reproduced if missing. Example: Chair rungs get a great deal of wear and frequently break. They can be turned to match the originals, glued back in place and then finished to match. Repairs – Veneer: To the surprise of many, the majority of furniture has some veneer on it. Since veneer is very thin, it can fall prey to damage through the years, especially around the edges of tops. Gluing in veneer patches is not the best way to repair veneer. It is often better to carefully patch in the missing veneer with a durable filler and finish match it to surrounding wood. This can make for a virtually undetectable repair. Example: A 1930’s walnut veneer dining table top had a hand size damaged area in from the edge. After carefully cutting damaged/unattached veneer back to sound veneer, an epoxy patch was placed and leveled. This was then base coated , glazed, grained, tinted and then finished in with the overall topcoats.